Another Christmas under my belt! 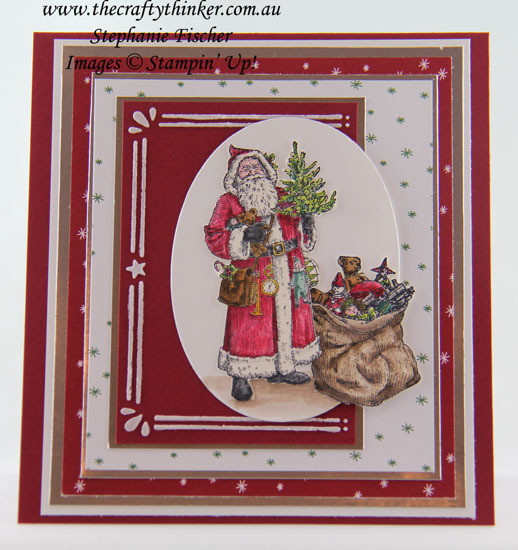 I combined the gorgeous Father Christmas stamp set and Be Merry Designer Series Paper from the Annual Catalogue with the new Cardfront Builder Dies from the Holiday Catalogue. The exciting news is that Stampin' Up! 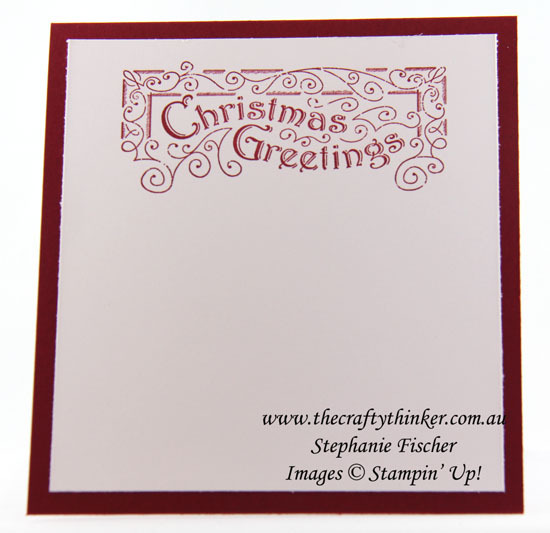 have released this product (and the matching Carols of Christmas stamp set which can be purchased as a bundle) early. Of course, I could have simply used the die to cut the design in the Cherry Cobbler piece and placed a piece of Whisper White cardstock behind it to show through but .... I'm addicted to Embossing Paste! So instead, I cut a stencil from Window Sheet with the die and spread on some paste! I watercoloured the image with Real Red, Cherry Cobbler, Pink Pirouette, Powder Pink, Crumb Cake, Soft Suede, Peekaboo Peach, Crushed Curry, Smoky Slate, Tuxedo Black, Lemon Lime Twist and Tranquil Tide. Where is the Peekaboo Peach? It's underneath some Soft Suede in the bears and Santa's snappy man bag! (Maybe in my next rendition he'll have learned to have matching accessories! ).